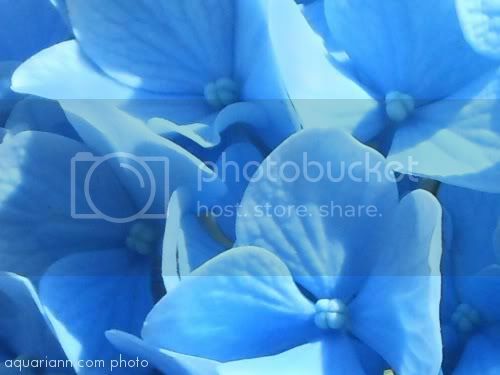 Beautiful - I love blue flowers of any kind. That is an incredible shot. It looks surreal! I love the blue. I don't see a lot of blue flowers. Beautiful blue image - magical! This is gorgeous! Love it! Happy WW! Amazing color and pretty details! I love hydrangeas!! They're so beautiful!! The photo is of a real hydrangea bush, ngpaloma - I darkened the color levels only slightly when editing the original shot. Lovely capture of the color blue! Very pretty flowers and photo. That shade of blue is such a relaxing color. So pretty! My wedding cake was covered in blue hydrangeas. That is a truly amazing close-up! I was just looking at your post for August sponsors. I've never advertised before but maybe I should try it out. I'd advertise my blog as my Etsy shop is in need of an update after the summer. Do you think I'd be a good fit?? The color is so beautiful. And the poem quotes makes the shot! Have a blessed day. Such intense hue of blue, I love the capture and the quote. It is said that blue is soothing and healing and I felt an instant touch of comfort just seeing it. What a beautiful shade of blue! Awesome! Thanks for hosting. You did a great job capturing that rich blue color! Thank you so fairy much for your interest in being a blog sponsor, Paula! I'm convoing you right now. They are beautiful! I love the color! Beautiful blue flower. Thanks for linking it up. the photo of the flower is beautiful..